Set on a half-mile stretch of white sand on Montego Bay’s beautiful peninsula. Approx. 15 minutes from the airport. 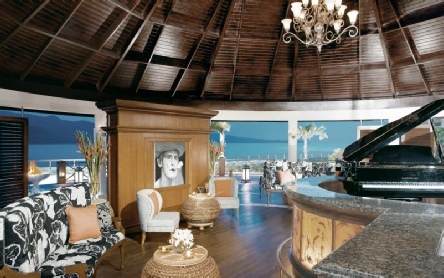 All of the resort’s 350 suites overlook the Caribbean Sea and showcase charming British colonial interiors. The Junior Suites are spacious and overlook the Caribbean Sea and offer the option of upgraded facilities with access to the Preferred Club Private Lounge. Upgrade to the Preferred Club Oceanview Swim-Out Junior Suites, and you can enjoy the convenience of a pool at the end of your balcony and Preferred Club Private Lounge access. 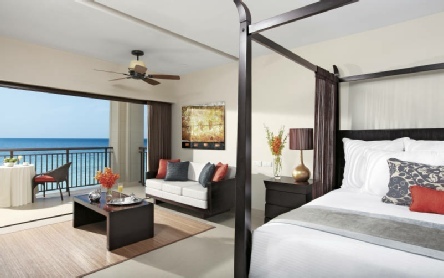 For the ultimate in luxury, perhaps choose an Oceanfront Suite, featuring expansive living space, a Jacuzzi balcony and a world of opulent facilities. Inside the resort, you’ll discover a world of facilities to cater to your every need. Thrillseekers will love the watersports centre on the beachfront, where a world of non-motorised watersports await. Sun worshipers can lounge in the gardens, by the two swimming pools or in front of the azure Caribbean Sea, and those searching for the ultimate in relaxation can head to the perfectly sumptuous Secrets Spa by Pevonia. Neighbouring Secrets St James and Secrets Wild Orchid share an extensive range of facilities. Wild Orchid offers a more vibrant atmosphere as it is closer to the lively Promenade which boasts a number of shops, restaurants and bars. A wealth of reservation-free dining options includes Mexican, Jamaican, Pan-Asian and Italian cuisine and a number of stylish bars include a sophisticated piano bar and a lively music lounge for late night dancing. Browse the Promenade’s selection of shops for classic Caribbean keepsakes such as jewellery or handicrafts. Cool down in the main swimming pool whilst enjoying fantastic views of the sea and a refreshing drink from the swim-up bar. Dine on grilled specialties and sumptuous seafood whilst taking in the stunning sea views at Oceana Restaurant or relax with a light snack or cocktail on a swinging seat at the beachside Barracuda Bar. A popular food cart roams the resort offering delicious jerk chicken, jerk burgers and refreshing coconut water. There is also a state-of-the-art fitness centre, tennis court and a lavish spa which offers blissful treatments amid zen fountains and lush gardens. A range of sports and activities include non-motorised watersports, volleyball, yoga, bicycle hire and dance classes. Live shows and films can be enjoyed at the theatre and there are also weekly cocktail parties, theme nights, films on the beach and a gaming lounge. Unlimited-Luxury® All Inclusive - All meals and premium brand drinks, Minibar refilled daily, pool and beach service, landsports and activities including tennis, basketball, bocce ball, darts, jogging track, volleyball and yoga, non-motorised watersports including sailing and kayaking • Nightly theme parties and entertainment. A chic resort, designed to reflect the island’s natural beauty and African roots. Set on a glorious sweep of soft white sand at the livelier end of the Montego Bay peninsula, this luxurious adults only retreat offers a vibrant atmosphere reflecting its lively promenade location which boasts a number of shops, restaurants and bars. 2019 package holidays to the Secrets Wild Orchid, Jamaica Prices are per person based on two sharing.